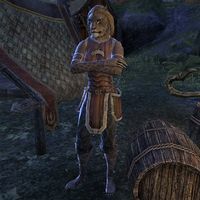 Dahari is a Baandari Khajiit found at their trading post located in Malabal Tor. A Tangled Net: Reward the mercenaries for their prowess against the werewolves. "Many years I have traveled, in search of the finest luxuries! Have you ever lain on a rug that once graced the steps of the White-Gold Tower? Or drank from a cup forged in the bowels of Ash Mountain?" Eraral is looking for …. "Don't repeat yourself. I know what's at stake. You'll have support. But make sure Eraral remembers us after he's out of this mess." I'll be sure to remind him. This page was last modified on 17 November 2018, at 00:54.